We have been biting our tongue trying not to spill the beans, but this was really BIGS news which we wanted to share. We got the green light a few minutes ago to announce this to EvoM, so this is the 1st places where you will see this information! Fortune Auto will be announcing the formal release this Friday and JB is the only place right now you can pre-order these. 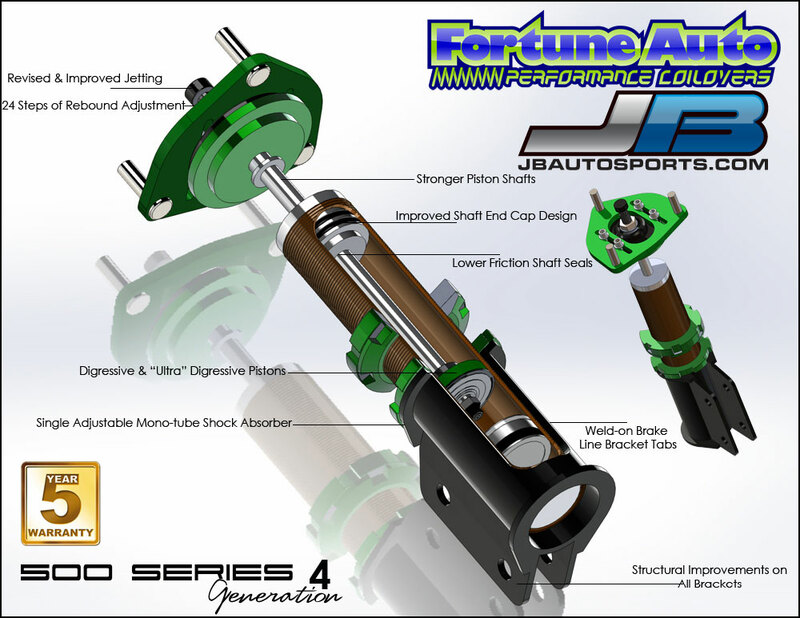 Fortune Auto Generation IV coilovers have just been announced!!! 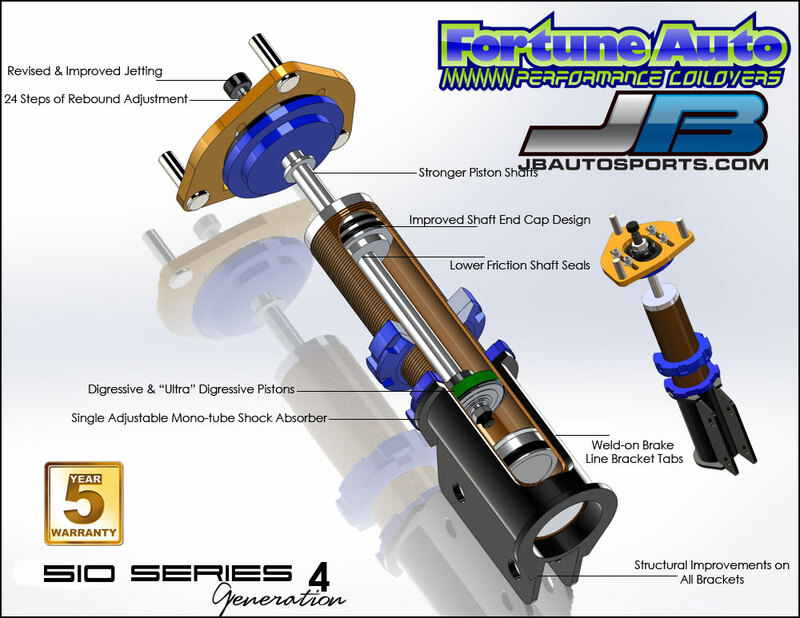 Revised Jetting - When the Fortune Auto engineers designed the Generation 4 Series, they made it a priority to revise the jetting for more accurate damper control. The engineers also increased the adjustment range. Every click in the adjustment range now has a very profound effect on damping force and each click is very audible and distinct. We responded to our clients' comments regarding the lack of audible distinction in the clicking mechanism. Our desire is to constantly refine our products using the valuable feedback from our clients, so we have addressed this issue with our Generation 4 shocks. Stronger Piston Shafts - The data we have compiled through our racing program has been thoroughly implemented in our new Generation 4 Series. The delicate science behind the strength of piston shafts can be difficult to perfect. If the shaft is too hard, it will be brittle and break easily, but if the shaft is too soft it will bend too easily. Through extensive R&D we were able to achieve an optimal balance between shaft hardness and malleability in the Generation 4 Series to ensure peak safety and performance. Lower Friction Shaft Seals - The new Generation 4 shaft seals have 40% less drag than our previous models. This provides for less hysteresis and for superior control of driver inputs. Our new seals are made of a specially formulated Buna rubber compound that provides a great balance between reliability and performance! Since the shaft seal is the most important seal on the shock, a stronger seal will greatly improve quality and performance. Improved Shaft Cap Design - Our new shaft caps utilize a twin O-ring design. Furthermore we have upgraded our rubber O-rings to Viton O-rings. The new Viton O-rings are made of a synthetic rubber compound which provides a superior tensile strength and a wider range of operating temperatures. This new design provides a superior seal preventing potential leaks from developing. Structural Improvements - Utilizing our engineers' in-house design software we were able to revamp our whole line of suspension in the Generation 4 Series. We reinforced brackets and mounting points for more rigidity and strength. We also replaced the rubber bushings in the eye-bolt style lower brackets and upgraded them to urethane bushings. Brake Line Brackets - Now all models will have OEM brake line tabs welded to the lower mounts. This provides the end user with a clean and safe install solution. Digressive & Ultra Digressive Pistons - To ensure superior ride quality and driver control, the digressive piston technology on our 500 and 510 series has been carried over to the Generation 4 Series as well. All Generation 4 shock absorbers will continue to utilize our digressive piston technology on our 500 series models and ultra digressive piston technology on our 510 series models. Digressive piston technology allows for massive amounts of low speed rebound force that translates driver inputs into razor sharp control. Furthermore, the rebound force "blows off" to provide the driver with a supple and compliant ride while maintaining superior mechanical grip over rough surfaces. Dyno-tuned and Tested - Our commitment to providing the best shock absorber in the market has not changed with the Generation 4 Series. EVERY shock absorber is still dyno-tested at our facility. We do not spot check our shocks like some other manufacturers. Once your shock absorber is built it is tested and matched. We refuse to treat our shocks with a “one size fits all” mentality. Our philosophy is simple. We provide our clients with a high quality, affordable, and personalized suspension solution. Fortune Auto 500 cut-out showing improvements! Fortune Auto 510 cut-out showing improvements! All of this and still at a very affordable price! This is definitely a great entry-level coilover! Fortune Auto is continuosly stepping up its game to bring value and the most bang for the buck. This is the sort of product we at JB Autosports appreciate and like to promote. If you want pricing or want to place an order, feel free to contact us directly.